You’ve done the cutting, raking, and baling, and now you have a field of round bales ready to be stored for future use. You’ve put in the time, money, and effort; why not do your best to preserve your investment? Glenn Selk, emeritus extension animal scientist at Oklahoma State University (OSU), provides advice to minimize hay storage loss in OSU’s Cow/Calf Corner newsletter. 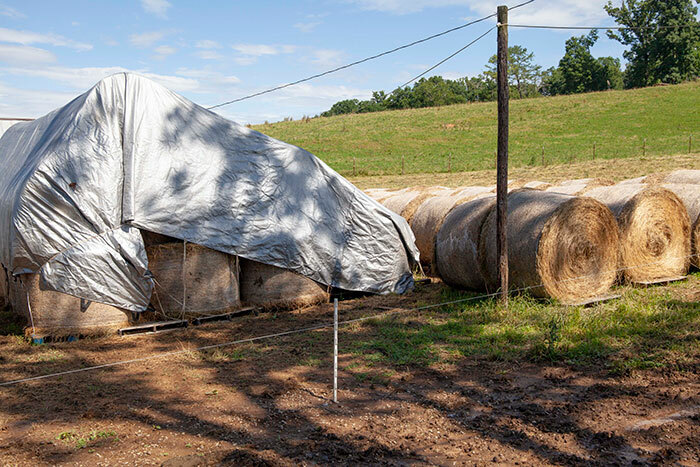 Selk references a study completed at the University of Tennessee where researchers compared different methods for storing large grass hay round bales. The hay was cut and baled in June and stored until January when it was fed as supplemental forage. Bales were weighed at harvest as well as at feed out. 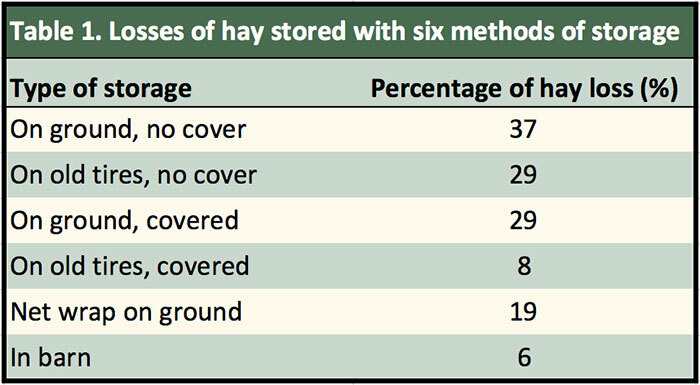 The resulting hay loss percentages are displayed in the table. While the average rainfall for Tennessee may not be applicable to all portions of the U.S., the rankings in storage loss still apply. “Obviously, it would be ideal to store hay inside, but that will not often be practical,” Selk stated. Selk recommends storing hay under a rain shedding cover off the ground as the next best option. Selecting a storage site is another decision that influences storage loss. A site that is not shaded with an open breeze will provide ideal drying conditions. To minimize moisture absorption, select a site that is well drained. Moisture absorption can lead to as much as 12 inches of the bottom of the bale lost. Over half of dry matter losses can be attributed to ground contact. Use low-cost, surplus materials such as discarded pallets, railroad ties, and tires to keep bales off the ground. A 6-inch deep layer of crushed rock is another option. “Some expenses may be necessary to obtain surplus materials. However, if 10 to 20 percent of the hay crop is saved each year, then it will not take long to recover those original costs,” Selk assured. Selk recommends storing uncovered bales in rows, butted end-to-end, running north and south with at least 3 feet between rows. This will allow appropriate sunlight penetration as well as airflow to allow the area to dry faster following rain. If the bales are going to be used before early spring, orientation isn’t as important due to the low level of losses until that time. Storing bales into the summer in rows running east and west can lead to severe deterioration on the northern side of the bales.